Jack Bowes was the envy of a lot of people growing up. Sporting wise, he was good at everything he tried. You know, that kid who did about eight things at once and was talented at them all. Footy, cricket, soccer, futsal; you name it, he played it. 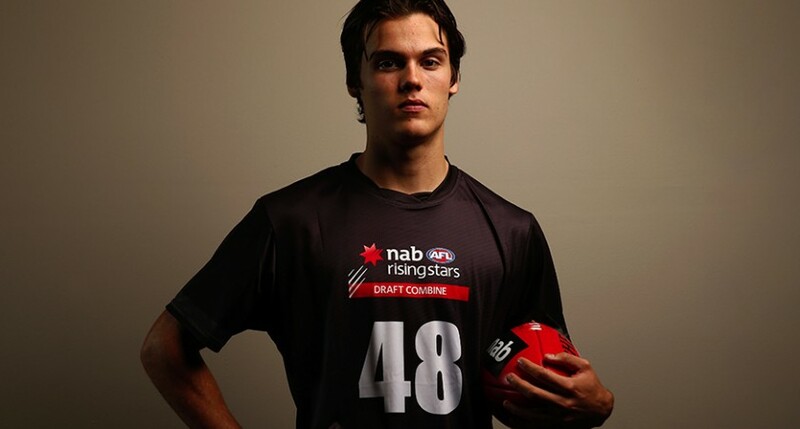 That’s why it should surprise no one that Bowes’ name has been thrown into the pick one conversation before the NAB AFL Draft this Friday night. Despite all his options, for the last two years footy has consumed his life. He couldn’t put into words why it took preference; it was just an underlying love that made it all happen. “Footy was always there. I was about 15 when I gave up the other sports and focused on footy,” Bowes said. Jack Bowes the footballer is a smooth-moving, ball winning, goal kicking machine. He busts a gut in the midfield yet moves so effortlessly. He seems to have more time and space than most, which is why he is so highly touted. But who is he as a person? Bowes was born and bred in Cairns. He spent his formative football years between the walls of the Manunda Hawks and the Cairns Saints, which was where he made his senior football debut at just 15. As he entered his bottom age Under 18 year he had a decision to make. Continue to live up north with his parents and brother? Or chase a dream on the Gold Coast, moving away from home? “It wasn’t easy that’s for sure. It was a pretty big decision. I think the thing that got it over the line was Nan and Pop moving down just before I did. Being able to live with them made it so much easier, I don’t know if I would have survived otherwise,” Bowes said. It was the SUNS who got him down, and the SUNS who took him under their wing. “They relocated me and looked after me, but the access they have given me to resources you usually don’t have are outstanding. Great facilities, doctors, coaches, all of it, I owe a lot to them,” he said. While living away from his family is tough, there has still been a familiar voice on the other end of the line each step of the way. “My Dad is my role-model. It’s been pretty hard living away from him, but he is the first person I call when I want to talk about footy and life. He has supported me since day dot. He never pushed me into choosing footy, but has always supported me in everything I do. He has been a massive influence on me,” Bowes said. Injury meant that his 2015 campaign was limited. He sat on the sidelines as the Queensland Under 18 team took out the Division 2 National Championships, which made him even more hungry going into 2016. “I was pretty devastated to miss the National Championships, but those guys set a great example and pathway for us this year,” Bowes said. Coming into 2016, the floor was his. Boy did he make the most of it. Queensland MVP, NAB AFL Under 18 Division 2 MVP, Allies selection, Under 18 All-Australian, and averaging 19 disposals, three clearances and a goal for the SUNS in the NEAFL… he couldn’t do much more. Those performances led to a lot of chatter about Bowes, where he would be taken in the draft, and who might bid for him before the SUNS first selection. When I say a lot, I mean everyone has an opinion, but it’s something he hasn’t paid much attention to. “I like to take opinions from the people I know and am close to. I’ve got people in my support group that I listen to, and those are the opinions that matter the most. Obviously you read stuff, but you can’t pay too much attention to it.” Bowes said. Bowes just gets out of bed each morning and tried to improve. That’s what makes him tick. “I think it’s the passion for the game and wanting to get the best out of myself is what drives me. I’m a pretty competitive person, I want to wake up each day and make something of it; get the most out of myself. If it means doing extras so be it. I am doing it for myself and my family,” he said. Now, he is one day away from jumping on a plane to Sydney to be in the room on draft night. It’s getting very real.